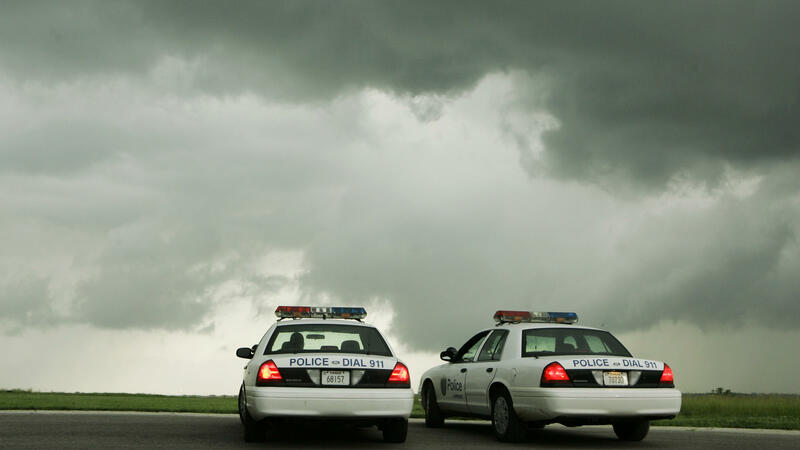 Police officers in Lawrence, Kan. watch thunderstorms move past the city in 2008. When Fennelly was a neighborhood resource officer in 2014, the Lawrence Police had a Facebook account with only 1,500 likes, and he was searching for a way the department could better engage with their community. But when he first pitched the Twitter account in 2015, Fennelly says he had to get approval for almost everything he posted. "Initially, our tweets were bad, so we didn't have much of a following in the beginning," he says. "[There were] lots of hashtags, lots of '@ mentions,' really boring stuff." Then in March 2016, he tweeted about the University of Kansas loss to Villanova University in the NCAA college basketball tournament. Fennelly says it was the first humorous tweet he tried in an attempt to increase their engagement. A sports editor at The Kansas City Star retweeted it, and Fennelly says it became the account's first tweet with national reach. "It ended up getting a couple thousand likes, over 1,000 retweets," he says. Now, along with crime alerts and incident updates, Fennelly gets to have some fun. More importantly, he says, Twitter is a way to engage with the community the police department serves. "Being in a university town, we have a really high population of people age 18 to 25, and so I really saw Twitter as an opportunity to reach those people," Fennelly says. "And that was a demographic that we were kind of missing as a police department prior to that." He says he and his colleagues know that Lawrence residents are reading the posts because they come up to them on the street to talk about them. "I feel like their familiarity with what we're putting out on Twitter makes them feel a personal connection to an officer that they come across in the community ... they can go up to an officer and say 'Hey, just want to say — love your Twitter account, think it's great,' " Fennelly says. "For officers to be able to have that interaction, I think that's the best thing that we can hope for in our community policing efforts." The Lawrence Police Department's Twitter account now has more than 100,000 followers — more people than the most recent census estimate for the city it serves. Mallory Yu and Renita Jablonski produced and edited the audio story. Sydnee Monday adapted it for the Web. This Friday is 4/20, as in April 20. Also as in 4:20, like marijuana. The police in Lawrence, Kan. have been tweeting some tips. DREW FENNELLY: (Reading) If it's 4:45 on 4/20 and you get pulled over and you've got orange or red Cheeto dust on your fingertips, that's what we call evidence. CHANG: (Laughter) OK. That is a joke, if it is not clear. Officer Drew Fennelly runs the department's official Twitter account. Here's one of his other tweets from yesterday. FENNELLY: (Reading) This post does not condone smoking Mary Jane. But my boss says I have to clarify that, as a police department, we do not condone smoking reefer. Again, driving high is still DUI, and that ain't no joke. CHANG: His tweets get thousands of likes. SHAPIRO: Officer Fennelly began the account in 2015. Back then he had to get approval for almost everything he posted. FENNELLY: Initially our tweets were bad. So we didn't have much of a following in the beginning. SHAPIRO: Then in March of 2016, he tweeted this about the University of Kansas's loss to Villanova. CHANG: (Reading) Sorry we can't investigate Villanova ripping your heart out of your chest. The crime occurred outside our jurisdiction. FENNELLY: It was the first tweet that we went with humor to try to get better engagement, and it ended up getting a couple thousand likes, over a thousand retweets. SHAPIRO: We started scrolling through the feed, and before we knew it, our staff was reciting the officer's tweets from this past Valentine's Day. UNIDENTIFIED PERSON #1: (Reading) Cops are not poets. So is this poem a haiku - absolutely not. Don't break the law, criminals. UNIDENTIFIED PERSON #2: (Reading) Shall I compare thee to a summer's day? Thou art more lovely and more temperate. Thou wander'st into a store and pays for thou's stuff before leaving. CHANG: Officer Drew Fennelly says he and his colleagues know that people in Lawrence are reading the posts. FENNELLY: People on the street, when they come up to officers, they want to talk about the Twitter account. And I feel like their familiarity with what we're putting out on Twitter makes them feel they can go up to an officer and say, hey, just want to say, love your Twitter account. For officers to be able to have that interaction, I think that's the best thing that we can hope for. CHANG: He says it's part of the department's community policing efforts. SHAPIRO: Lawrence Police Twitter account now has more than 100,000 followers - by some counts, more than the population of the city itself. Transcript provided by NPR, Copyright NPR.